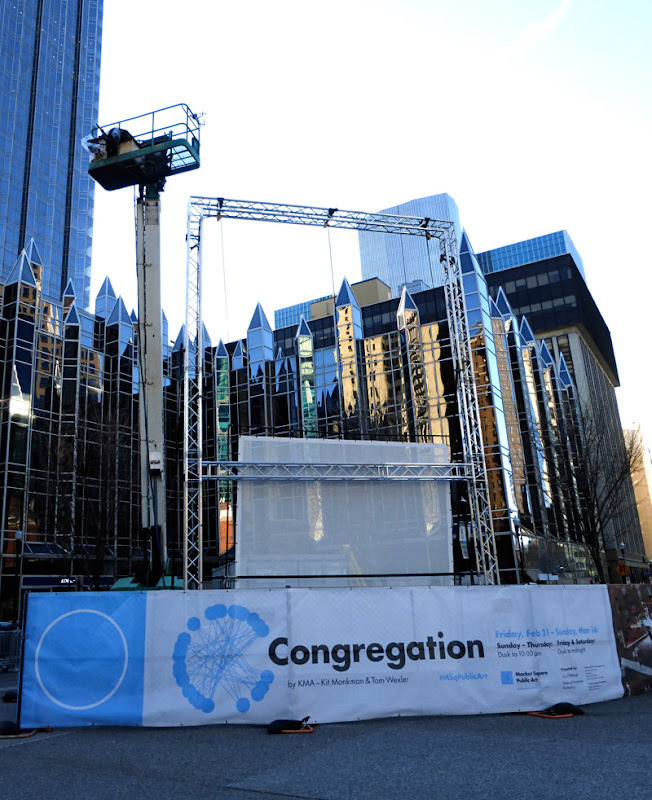 The Market Square Public Art Program is a collaboration of the Pittsburgh Downtown Partnership and the Pittsburgh Office of Public Art. 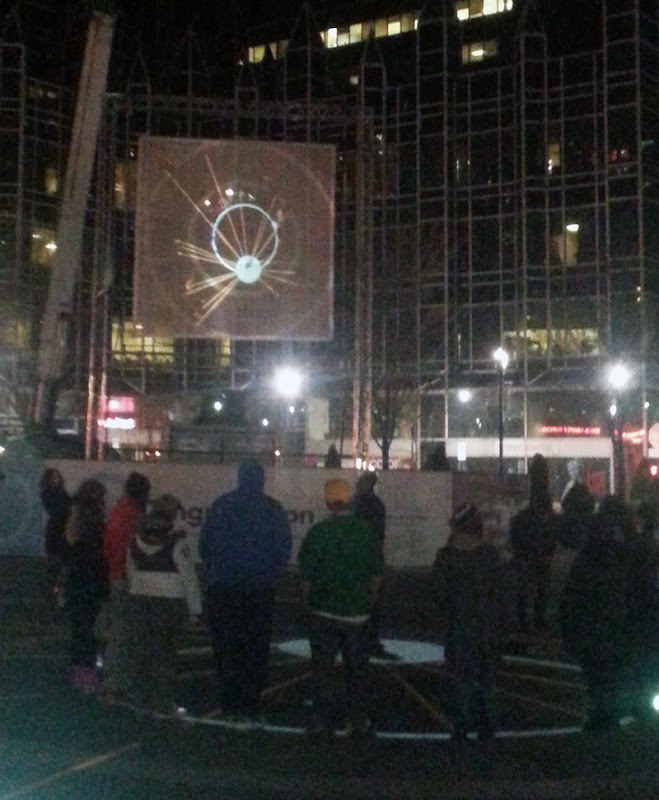 Their goal is to bring new, interactive art to the city in the winter. These temporary exhibits will run for a short time each winter over the next few years, bringing something interesting into town to encourage us to venture out in the cold. Mix-N-Match by Allard van Hoorn uses sound for the primary medium. For several months the artist worked with local groups to create eight sound tracks unique to this space. From local tap dancers to the sounds of brooms sweeping Market Square clean, these unusual and site-specific recordings make an eclectic combination. For detailed information about the various participants and links to the soundtracks, visit the page on Mix-N-Match on the Market Square Public Art Program's website. In an interview on KDKA's Pittsburgh Today Live, the artist explained that when he looked at Market Square on Google Earth that it looked like a record player to him. He used that as his inspiration to create a giant, interactive record player using the music recorded by those local community groups. The idea was influenced by how the Aborigines in Australia relate to the land through music. Mr Van Hoorn wanted the installation to stimulate people into thinking about how to use public space. A Winter Landscape Cradling Bits of Sparkle by Jennifer Wen Ma turned Market Square into a small, unique forest. For this display, several different types of trees were used. Small, glass sculptures were scattered throughout adding those Bits of Sparkle . Using Chinese ink, the trees were painted black giving the display contrast and making the emergence of new growth more striking. Some fruit trees were budding at the start of the installation and blooming before it ended. Unfortunately, we weren't able to get photos while this installation was up. The first piece in this series, Congregation by KMA, debuted February 21, 2014. 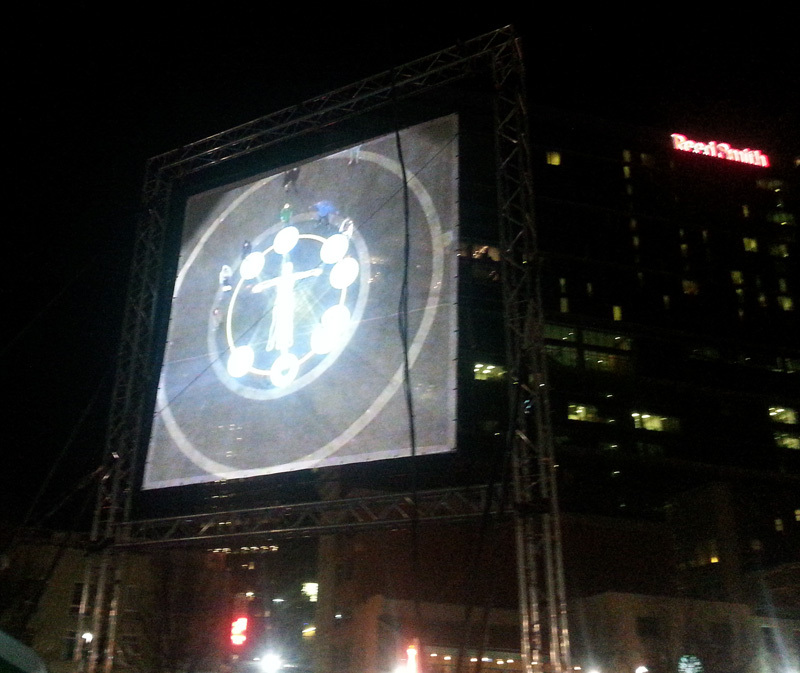 For three weeks it became the focal point of Market Square after dusk. Kit Monkman and Tom Wexler are the artists that make up KMA. 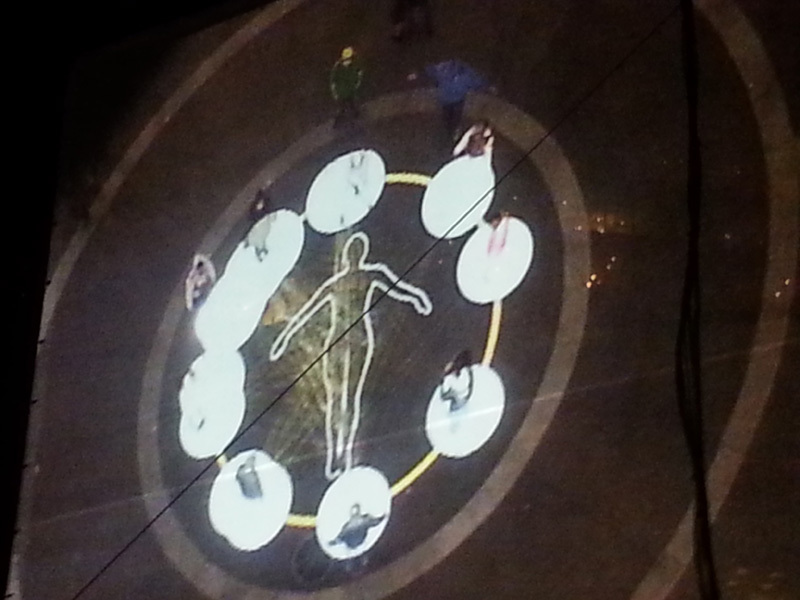 They are UK artists that use light and motion to create interactive public art displays. Congregation was introduced in 2010 at the Shanghai World Expo for the UK pavilion. It’s appearance in Market Square marked it’s North American premier. Visiting Market Square during the day, the only hint you had that anything unusual was there, was a big crane and blank screen off to the side. At dusk though, the motion sensors mounted on that crane worked with the pedestrian traffic in the public space below and images were projected on both the ground and the screen. Circles appeared around the people and lines of light connected the participants. Abstract shapes and silhouettes joined the mix to produce an interactive form of art using light as the medium. Relationships were created between the individuals, the crowd, and the city itself forming a Congregation. On their website, KMA explains their idea to illuminate people as Rejecting the historical notion of the citizen as a passive spectator and go on to say KMA’s work celebrates the dynamics of human movement rather than the facets of historic buildings. KMA’s most ambitious work to date, Congregation will be the world’s first ever ballet designed, choreographed and composed entirely for pedestrian performers. There will be no rehearsal and no textual input: participants will simply respond to the choreography of light and sound in an embodied, rather than verbal, discourse. The score for Congregation has been created by Portland-based composer Peter Broderick.